When a 59-year-old Carrie Fisher reprised her role as Leia in 2015’s Star Wars: The Force Awakens, there was an inordinate amount of discussion online of her appearance and whether or not she had “aged well.” Numerous unkind comments were made, especially about her weight. It was all pretty ridiculous, not to mention offensive, and Fisher herself responded in typically blunt, sardonic fashion to the criticism. What she didn’t do was set her response to music. That’s where the comedy music ensemble Power Salad comes in. 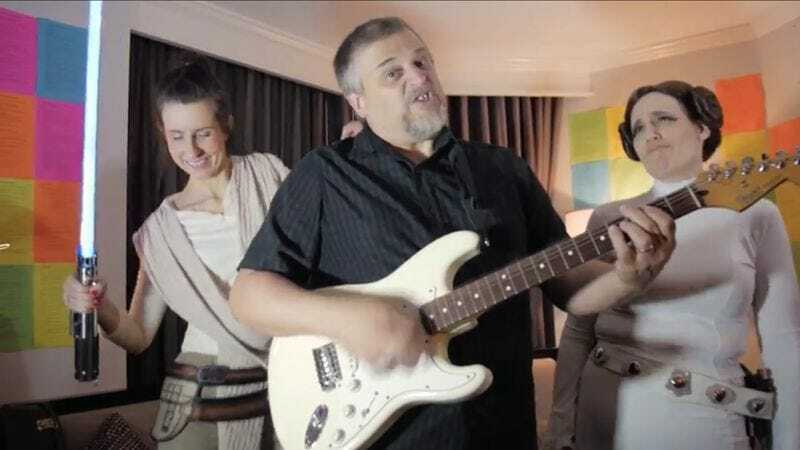 Their latest video, “Leia (And Other Star Wars Parodies),” takes its melody from the 1970 dad-rock classic “Layla,” originally written by Eric Clapton and performed by Derek And The Dominos. Clapton’s version was about his insatiable lust for Pattie Boyd, then George Harrison’s wife, but Power Salad’s version is about snarky internet commenters unaccustomed to the sight of a human woman aging normally in public. The guitar heroics have been kept intact. “Leia, you still look fine to me,” sings frontman Chris Mezzolesta. “Leia, in IMAX and 3-D.” A no-nonsense Carla Ulbrich portrays Fisher in the video and offers some choice words for her online critics, with quotes taken directly from the actress’ own tweets: “Please stop debating about whether or not I’ve aged well,” she says. “My body hasn’t aged as well as I have. Blow us.” The video, featuring multiple dancing Star Wars characters, is a production of The Funny Music Project (or FuMP for short), a collective of like-minded novelty and parody artists. FuMPFest 2016, their weekend-long celebration of “comedy music and related weirdness,” is occurring at the end of August in Chicago.